It is the time of year where you may have already started thinking about school excursions. There is often a lot to consider; additional staff, insurance, transport, the list goes on. Let us take one worry out of your hands by helping you organise your school trip hoodies and clothing. We have a wide variety of hoodies, zip-hoodies and t-shirts available in many colours and designs – perfectly tailored to your school’s trip. We offer free print and embroidery set up on each and every one of our garments – so you can customise the design to suit your school’s ethos and tone without paying a penny extra! Adding a personalised print really puts a unique spin on your garments making them feel like a special memory to treasure. We ensure that all of our garments are available at affordable prices without compromising quality, a factor very important to us and we know that parents are much more preferable to higher quality lasting garments over wear-once fashion. We also have an exclusive, high-quality brand of hoodies from HUBACO, where we hand pick garments to give you only the very best. YourSchoolUniform.com have a dedicated team that work hard to meet your requirements in perfect time, and ensure each and every garment is produced perfectly for your school. 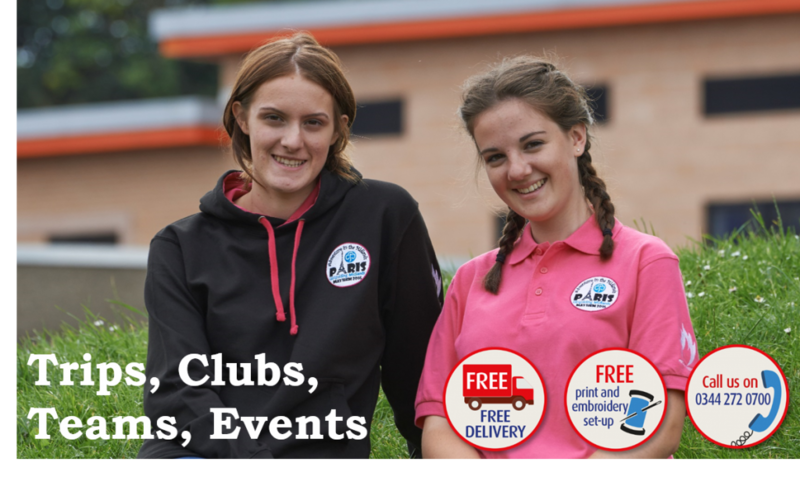 With prices starting from just £10.95 for school colour hoodies, and £5.50 for t-shirts we have packages perfectly suited for every group and budget. We have a very simple ordering process, so you can quickly and easily get in contact with our account managers and they will get you on the right road for designing and setting up your trips hoodies. We have a few trips and clubs sample prints in which you can use, or tailor specifically to fit your school and its excursions. 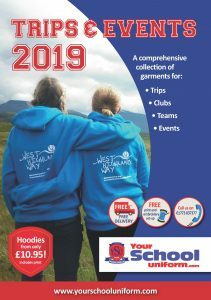 Hoodies especially can be a fantastic memento for each school trip, as your pupils can cherish their memories in the years to come with an ideal everyday piece of clothing. Students can feel like they are being transported back to the trip every time they slip the hoodie over their head – which can bring back memories of their special trips along with the social media posts and photos they make. Not only are they a wonderful memory of the trip for everyone involved, think about the extra peace of mind your staff will have when your students are in bright hoodies, which makes them easily identifiable in crowded streets and cities. Our hoodies are machine washable and hard-wearing, so can be worn time and time again without the garment colour or the memory of the trip fading. Are you looking to take your school excursions up a notch? We work closely with Terra Nova Expeditions Ltd. who offer bespoke and tailor-made adventures for schools and adults. Terra Nova Expeditions guide you through the whole process from fundraising to travelling. Each and every one of our trips are planned personally by our team, and the expeditions are designed to make a difference to both the young people that travel; to the wilderness areas they venture to, and to the communities they interact with. Each of our leaders are fully qualified with decades of experience between them, and all specialists in their field so you will experience nothing but the best when choosing Terra Nova Expedition Services Ltd. We plan trips all across the globe from the hottest of deserts to each of the freezing poles, so have the ideal trips for every school and group. Contact Hannah at HannahV@terra-nova.co.uk or call our main offices on 01773 833300 and we can discuss the ideal trip for your school. Furthermore please visit our website to learn a little more about the services we offer www.terra-nova-expeditions.com. Please see below a few pictures from our recent trips to Morocco, Greenland and Uganda.